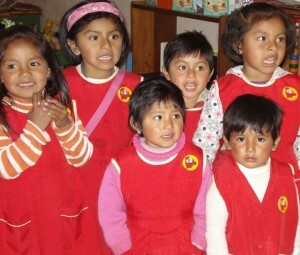 Early childhood care and education supports healthy development and gives working moms in Bolivia, and around the world, peace of mind. Genevieve visits IPTK CICOM early childhood education centre. When I became a mother, it was truly the greatest moment of my life. I never fully understood the unconditional love a mother has for her child until I held my beautiful Jane for the first time. I knew that my life would never be the same. Jane would forever be the centre of my world. I would spend my days devoted to her health and happiness in one way or another. I am now expecting my second child and am a little more prepared for the remarkable gift of motherhood and all the joys and challenges it brings. As Regional Program Manager – Americas at Canadian Feed The Children, I am proud to tell my daughter about the important work we do each day and find myself always inspired by the families who are benefiting from our programs. Especially the mothers. They are just like us: parents whose children are their greatest joy. They too are devoted to the well-being of their babies. Each day, these women get up and work hard so that their children’s dreams might one day come true. As Mother’s Day approaches, I’ve been thinking about the mothers CFTC and our donors help: strong, passionate women who work tirelessly every day for their families and in their communities, with their children at the heart of all that they do. As a working mom, I am careful to balance a career while still being the best mom possible for my daughter. It is a challenge, especially in these early years when children are most vulnerable. I know I am not alone. Mothers everywhere are faced every day with the tough choice of how to provide quality care for their children while they are working to provide for their family and contribute to society. I know I struggled when looking for preschool for Jane – and I had several choices. What would I do if there was nowhere safe for her to go? No place to help her grow, learn and thrive? In my work with CFTC, I have met mothers and children who face the most daunting obstacles. Their needs are like ours – compassionate, reliable caregiving when we are away at work; a stimulating place for our children to learn and grow; a safe and inspiring place for them to socialize, rest and play – but their reality is so completely different. 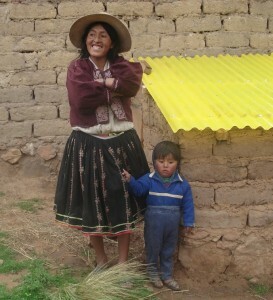 I met one such mother – actually, a grandmother and mother – on a recent trip to Bolivia. Casimira is the sole supporter of her grand-daughter, two-year-old Norita. She was forced to bring Norita to work in the hills with her each day, where the toddler would sit for hours under the hot sun and eat whatever cold food her grandmother could pack for the day. 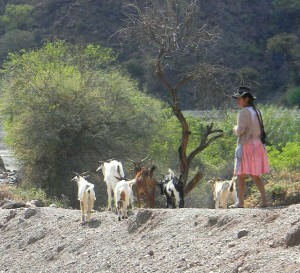 Young Bolivian woman tending her goats in K’acha K’acha. Casimira and Norita live in K’acha K’acha, a remote rural community near Sucre, Bolivia, which has little access to essential social services. 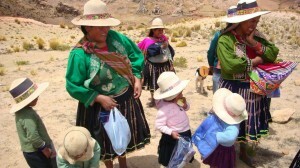 Mothers here rely on farming and petty trade as a source of income to support their families. Access to quality education is limited, as there is only one school to accommodate the children of K’acha K’acha and five other surrounding communities. Childcare services were non-existent for children under six or for school-aged children in the after-school hours. Most mothers had to bring their children to work or, in many cases, leave their young children home alone or in the care of older siblings. Children at IPTK Early Childhood Education Centre. Thanks to the support of a generous group of CFTC donors, we are working with the community to provide childcare support, integrated early-childhood education and even after-school programs for the moms and children of K’acha K’acha. We have been able to build a community-based, early childhood development centre for children under six, offering parents in K’acha K’acha a safe place to bring them during work hours. We’ve also built a community-based drop-in centre for school-aged children and adolescents. The centre offers after-school programs and provides students with individual and group learning support, including tutoring, health, environmental education, and life-skills training. The centre also offers sessions for teenagers on topics such as family planning, reproductive and sexual health. Staff works with caregivers and parents, particularly mothers and pregnant women, to address the key determinants of health especially in children and adolescents. By creating options for early childhood education and care, CFTC is supporting longer-term, self-sustaining livelihoods and poverty alleviation in this community, while also taking care of children’s day-to-day nutrition, education and health needs. 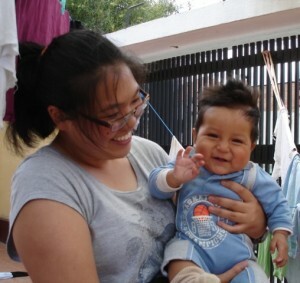 Norita is now cared for, and able to play and learn in a safe environment. She eats a hot, nutritious meal during the day and is thriving more and more. She is learning her numbers, enjoys drawing pictures and is making friends. Women and children of K’acha K’acha. All of this gives Casimira, Norita’s grandmother, peace of mind and comfort. Her work is still hard, and her life far from easy, but she can at least now provide for Norita and her own needs knowing that her grand-daughter is loved and cared for while she is busy working in the hills. Of course, many more children – and their moms – from surrounding communities here in Bolivia are waiting for opportunities like these to become available and that’s why this work continues to need support. But for Casimira – and for me! 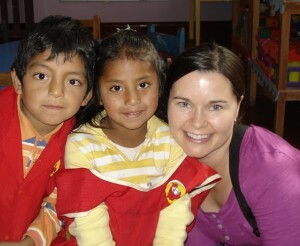 – this work represents a small but important step towards helping children, and moms, thrive in Bolivia.